Introduction: Hospitalizations because of acute exacerbated COPD (AECOPD) are a major burden to patients and the health care system. Interventions during acute and post-acute hospital care exist not only to improve short-term outcomes but also to prevent future exacerbations and disease progression. We aimed at measuring the implementation rates of acute and post-acute hospital care interventions for AECOPD. Methods: We performed 24 months (January 1, 2012, to December 31, 2013) retrospective medical chart review of consecutive cases hospitalized to one of three public hospitals in the canton of Zurich due to AECOPD. Implementation rates of five acute care and seven post-acute care interventions were assessed. Results: Data from 263 hospitalizations (61% male, mean age 68.5 years, 47% active smokers) were analyzed. The median length of stay was 9 days (interquartile range [IQR] 6–12 days). In all, 32% of hospitalizations were caused by individuals with previous hospitalizations because of AECOPD. Implementation rates of four acute care interventions were >75% (lowest was appropriate antibiotic therapy with 56%). Compared to this, implementation rates of five post-acute care interventions were <25% (lowest was patient education and self-management advice with 2%). Conclusion: The results of this audit revealed room for improvement mainly in post-acute care interventions for AECOPD. Several international audits and one large European audit of in-hospital care of patients admitted for AECOPD exist. However, the majority of these audits focused on acute measures of care and played little attention to implementation of post-acute measures.16–22 Recently, two single-center audits investigated on in-hospital post-acute care measures for AECOPD and reported low implementation of evidence-based recommendations.23,24 In Switzerland, data on quality of care regarding acute management of AECOPD are scarce, and no data exist regarding post-acute in-hospital care. Nevertheless, these data are essential to mirror possible gaps between recommendations and real-life management to establish targeted quality improvement programs. Therefore, the aim of this study was to investigate the implementation of evidence-based acute and post-acute management recommendations for AECOPD in three public hospitals in Switzerland. We performed a retrospective chart review of all patients who were hospitalized in the medical or respiratory ward of one of three public teaching hospitals in the canton of Zurich, Switzerland, between January 1, 2012, and December 31, 2013, due to AECOPD. Hospital 1 was the Waid City Hospital of Zurich. In the Department of Internal Medicine, ~4,200 inpatients are treated per year. In this hospital, there was no specialized respiratory unit; thus, patients with AECOPD were treated on the ward of General Internal Medicine by the regular staff. There were, however, board-certified pulmonologists working in this hospital performing consultations for patients with AECOPD if required. During 2012 and 2013, no pulmonary rehabilitation program for COPD patients existed in this hospital. Hospital 2 was the Cantonal Hospital of Winterthur, a referral center in a mixed urban and rural area. In the Department of Internal Medicine, ~6,800 inpatients are treated per year. In this hospital, there was no specialized respiratory unit; thus, patients with AECOPD were treated on the ward of General Internal Medicine by the regular staff. Board-certified pulmonologists conducted weekly visits and performed consultations as needed. An ambulatory pulmonary rehabilitation program was available during the evaluated time period. Hospital 3 was the University Hospital Zurich. It is a tertiary academic referral center featuring all medical specializations including General Internal Medicine and Pulmonology. Inpatient treatment of AECOPD is provided by the Department of Internal Medicine and the Department of Respiratory Medicine. Approximately 1,900 inpatients per year are treated in the General Internal Medicine unit, compared to ~800 patients in the Pulmonology unit. Patient allocation to these units was triggered by bed availabilities. The current audit was performed in both units, but outcome data were merged as one institution. During 2012 and 2013, no rehabilitation program for COPD patients existed in this hospital. 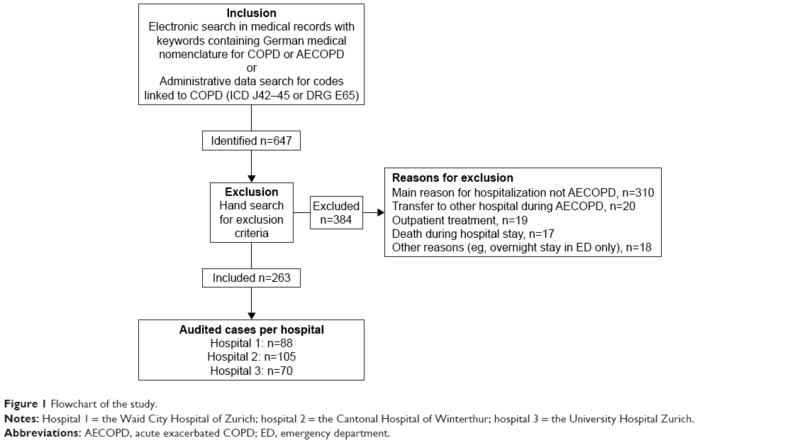 Hospitalization due to AECOPD was identified by applying an electronic full-text search in physicians’ documentations for keywords containing common German medical nomenclature for COPD and exacerbation and/or by searching in the hospital administrative database for established diagnostic codes linked to COPD (ICD: J42–45 or DRG E65). Keywords and diagnostic codes were selected to maximize the sensitivity of the search. After identification of the cases by electronic full-text search, exclusion criteria were checked for each eligible case by manual search, limiting the population to cases hospitalized and treated primarily because of AECOPD. Exclusion criteria included: 1) main reason for hospitalization was not AECOPD (eg, pneumonia, asthma, lung transplantation); 2) death during hospitalization (chronic care no longer relevant); 3) transfer to another hospital before hospital discharge and 4) other reasons like treatment in emergency department only (with stay over midnight and consecutive appearance as inpatient in administrative data). This research was submitted to the local ethics committee (Kantonale Ethikkommission Zürich; KEK-StV-Nr. 35/13, September 13, 2013), after which it was deemed to be exempt from further review and approval with no objection, according to Cantonal and Swiss federal law. All data were anonymized and did not require patient consent. We collected data using an anonymized case report form. The form was developed collaboratively based on templates of previous comparable COPD audits23,25 and was piloted to allow for necessary adjustments before start of the study. The complete medical records generated by the treating physicians during the whole hospitalization were reviewed on site by one of the authors (SM, DPF and KDL). In addition, discharge letters were reviewed for statements or recommendations with respect to the investigated measures. Besides the primarily investigated interventions in acute and post-acute care, demographic data, disease-specific data, information about pharmacological treatment and data about health service utilization were collected. The implementation rates of 12 acute and post-acute care interventions were outcomes of this audit. Acute care interventions were: 1) complete assessment of COPD cardinal symptoms at admission; 2) arterial blood gas analysis; 3) radiologic imaging within first 24 hours; 4) treatment with systemic steroids for at least 5 days and 5) appropriate antibiotic treatment (defined as administering antibiotics in cases with all three COPD cardinal symptoms or two cardinal symptoms, including more sputum purulence). Post-acute care interventions were: 6) smoking cessation intervention or counseling (only in currently smoking cases); 7) reassessment of inhaler technique; 8) influenza vaccination administration or recommendation in the discharge letter; 9) physical activity or capacity assessment or counseling; 10) referral to rehabilitation (directly or recommendation for rehabilitation in the discharge letter); 11) patient education and self-management support and 12) post-discharge follow-up. Categorical variables are presented as counts and proportions (n, %), and continuous variables are presented as values in median and interquartile range (IQR) or mean and standard deviation (SD) as appropriate. Implementation of care interventions are presented as rates, ie, numbers of cases with documented implementation divided by the total number of applicable cases (eg, smoking cessation interventions only assessed in currently smoking cases). We assessed the individual implementation rates and a composite score of implemented interventions for between-hospital variability with logistic regression models and analysis of variance (ANOVA), adjusting for age, gender, smoking status and illness severity. A p-value <0.01 was chosen to define statistical significance. Statistical analysis was performed using R, version 3.2.0 (The R Foundation for Statistical Computing, Vienna, Austria). During the years 2012 and 2013, totally 263 hospitalizations due to AECOPD were identified in the three audited hospitals (Figure 1). The median length of stay was 9 days (IQR 6–12 days), and 32% of these hospitalizations were caused by individuals with repeated AECOPD hospitalizations during the audited time period. Hospitalized cases were 61% male with median age 69 years (IQR 61–78 years) and 47% were active smokers (Table 1). Notes: Hospital 1 = the Waid City Hospital of Zurich; hospital 2 = the Cantonal Hospital of Winterthur; hospital 3 = the University Hospital Zurich. Abbreviations: AECOPD, acute exacerbated COPD; ED, emergency department. Abbreviations: IQR, interquartile range; BMI, body mass index; FEV1, forced expiratory volume in 1 second. The average composite score of the 12 implemented interventions was 5.9 (SD 1.6) across all audited hospitalizations. Among acute care interventions, the three hospitals most consistently implemented early radiologic imaging (96%) and treatment with systemic steroids for at least 5 days (79%). Appropriate administration of antibiotics was the acute care measure with the lowest implementation rate (56%), owing to overprescription in 38% of the cases and underprescription in 6% of the cases. Among post-acute care interventions, post-discharge follow-up was most thoroughly implemented: in 94% of the cases, at least a formal discharge letter was sent to a physician in outpatient care. Interventions for smoking cessation were found in 47% of the currently smoking patients. Referral to rehabilitation or at least an according recommendation was made in 24% of the cases. Remaining post-acute care interventions were implemented at rates <20%. Detailed results of average implementation rates are displayed in Figure 2. Figure 2 Interventions and implementation rates. Notes: Bars are overall average implementation rates (%) of interventions in AECOPD hospital care from all 263 audited cases unless declared otherwise. Orange bars are acute care interventions and blue bars are post-acute care interventions. Whiskers extend from the average rates of the hospital with the lowest to the hospital with highest implementation. *Subgroup without other indications for antibiotics, n=247; **subgroup of currently smoking patients, n=123. Abbreviation: AECOPD, acute exacerbated COPD. Between-hospital differences in the composite score of implemented interventions were small and ranged from an average of 5.4 (SD 1.4) in the hospital with lowest implementation rates to 6.5 (SD 1.7) in the hospital with highest implementation rates. After adjusting for age, gender, smoking status and illness severity, the differences in the composite score did not reach the predefined level for statistical significance (p=0.015). We found significant variability between hospitals in several interventions (refer Figure 2 for lowest, average and highest implementation rates of hospitals), such as assessment of AECOPD symptoms on admission (p<0.01), arterial blood gas analysis on admission (p<0.01), treatment with systemic steroids for at least 5 days (p<0.001), smoking cessation intervention or counseling (p<0.001), reassessment of inhaler technique (p<0.001), realization or recommendation of influenza vaccination (p<0.01), physical activity assessment or counseling (p<0.001) and post-discharge follow-up (p<0.001). In this study performed in three public hospitals in Switzerland, we assessed implementation rates of guideline-recommended interventions for AECOPD care. In acute care, these were fair to very high. In post-acute care, implementation rates were considerably lower. Moreover, we found significant between-hospital differences in implementation rates of several post-acute care measures without a particular hospital clearly performing better than the others when considering implementation summary scores. Results from our study are in line with various similar audits of in-hospital care for AECOPD from countries other than Switzerland.16,17,21–23,25 Most previous audits measured implementation rates of acute care interventions, revealing a generally fair performance. Of particular notice, considering the acute care measures is the potential antibiotic overuse found in one out of three hospitalizations for AECOPD. Antibiotics for COPD exacerbations showed large and consistent beneficial effects across outcomes of patients admitted to an intensive care unit (ICU). However, for outpatients and inpatients, the results were inconsistent.26 Growing antibiotic multiresistance, possible side effects and costs are compelling reasons to avoid antibiotics in patients for whom the benefits are unproven. The significant between-hospital differences in implementation rates of several post-acute care measures indicate that substantial improvements may not only be possible but also realistic. Checklists (also called care bundles) are disease management aids supporting clinicians to implement predefined elements of care in individual patients and improve important outcomes such as rehospitalization rates.32–34 For clinical practice, the implementation of such structured disease management aids seems advisable. Notably, however, post-acute care interventions must not necessarily be delivered in the in-hospital setting but can also be committed to outpatient care providers. For the chain of care, however, hospitals would ideally inform outpatient care providers about the already implemented interventions and those still recommended to be delivered. An automatized linkage between an electronic in-hospital AECOPD care bundle and the discharge letter generation might efficiently contribute to communication and comprehensiveness along the chain of care. In this study, we present a retrospective approach to assess in-hospital implementation of key elements of care in AECOPD. Especially in post-acute care, we contribute to the so far scarcely available data, and our approach and results may inform future audits or quality improvement initiatives in the field. There are, however, several limitations of this study: Owing to its retrospective design, information about implementation of specific interventions might have been lost. Some interventions may have been performed, but without proper documentation or notice in the discharge letter; therefore, leading to underestimation of the true implementation rate. In subsequent audits, researchers might want to introduce measurements of documentation reliability for outcomes with unclear documentation practice. On the other hand, the gaps we describe appear at least in communication to outpatient providers and are therefore still elements that could certainly be improved. We assessed post-discharge follow-up with a minimal requirement of a discharge letter to an outpatient physician. This very generous view on coordination of post-discharge follow-up must be regarded as potential overestimation because successful follow-up cannot be assumed to have occurred just because a letter was sent to an outpatient physician. Ultimately, between-hospital differences in implementation rates might have been biased by differing documentation practices within hospitals and by the individuals collecting the data for this audit. However, we developed the audit form based on forms from previous audits with similar questions and methods and the utilized form collaboratively by the auditors including a collaborative run-in period to improve uniformity of documentation. The results of this audit reveal room for improvement mainly in implementation and communication of post-acute care interventions for AECOPD. SM and CS-S participated in literature search. SM, DPF, KDL, SB, SW and TH performed data collection. SM, DPF, MK, TR, OS and CS-S participated in study design. SM, DPF, TH, MK, TR, OS and CS-S carried out analysis of data. SM, DPF and CS-S were involved in manuscript preparation. All authors contributed toward data analysis, drafting and revising the paper and agree to be accountable for all aspects of the work. Sharma G, Kuo YF, Freeman JL, Zhang DD, Goodwin JS. Outpatient follow-up visit and 30-day emergency department visit and readmission in patients hospitalized for chronic obstructive pulmonary disease. Arch Intern Med. 2010;170(18):1664–1670. Halbert RJ, Natoli JL, Gano A, Badamgarav E, Buist AS, Mannino DM. Global burden of COPD: systematic review and meta-analysis. Eur Respir J. 2006;28(3):523–532. Chapman KR, Mannino DM, Soriano JB, et al. 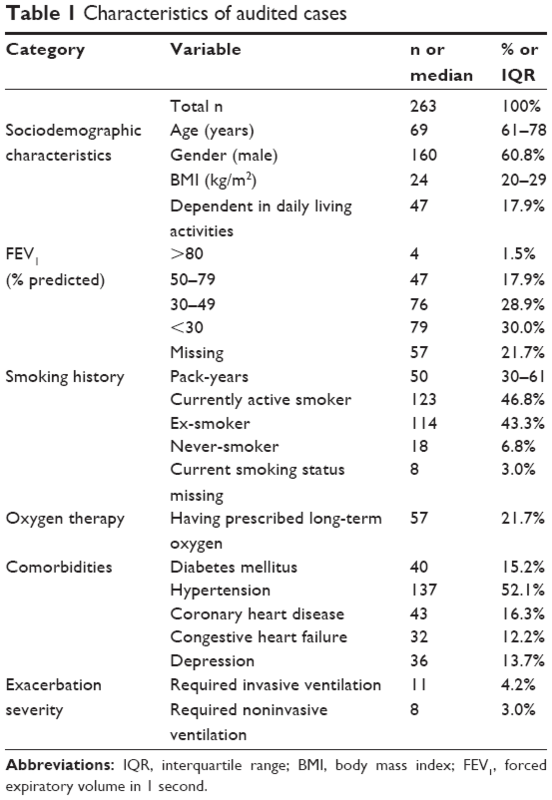 Epidemiology and costs of chronic obstructive pulmonary disease. Eur Respir J. 2006;27(1):188–207. Blasi F, Cesana G, Conti S, et al. The clinical and economic impact of exacerbations of chronic obstructive pulmonary disease: a cohort of hospitalized patients. PLoS One. 2014;9(6):e101228. Russi EW, Karrer W, Brutsche M, et al; Swiss Respiratory Society. Diagnosis and management of chronic obstructive pulmonary disease: the Swiss guidelines. Official guidelines of the Swiss Respiratory Society. Respiration. 2013;85(2):160–174. NICE, The National Institute for and Clinical Excellence. Chronic Obstructive Pulmonary Disease in Over 16s: Diagnosis and Management. 2010. Available from: https://www.nice.org.uk/guidance/cg101/resources/chronic-obstructive-pulmonary-disease-in-over-16s-diagnosis-and-management-35109323931589. Accessed September 11, 2017. Poole PJ, Chacko E, Wood-Baker RW, Cates CJ. Influenza vaccine for patients with chronic obstructive pulmonary disease. Cochrane Database Syst Rev. 2006;1:Cd002733. McCarthy B, Casey D, Devane D, Murphy K, Murphy E, Lacasse Y. Pulmonary rehabilitation for chronic obstructive pulmonary disease. Cochrane Database Syst Rev. 2015;2:Cd003793. Bourbeau J, Julien M, Maltais F, et al; Chronic Obstructive Pulmonary Disease axis of the Respiratory Network Fonds de la Recherche en Santé du Québec. Reduction of hospital utilization in patients with chronic obstructive pulmonary disease: a disease-specific self-management intervention. Arch Intern Med. 2003;163(5):585–591. Pelkonen M, Notkola IL, Tukiainen H, Tervahauta M, Tuomilehto J, Nissinen A. Smoking cessation, decline in pulmonary function and total mortality: a 30 year follow up study among the Finnish cohorts of the Seven Countries Study. Thorax. 2001;56(9):703–707. Harrison SL, Janaudis-Ferreira T, Brooks D, Desveaux L, Goldstein RS. Self-management following an acute exacerbation of COPD: a systematic review. Chest. 2014;147(3):646–661. Wagner EH, Austin BT, Von Korff M. Organizing care for patients with chronic illness. Milbank Q. 1996;74(4):511–544. Adams SG, Smith PK, Allan PF, Anzueto A, Pugh JA, Cornell JE. Systematic review of the chronic care model in chronic obstructive pulmonary disease prevention and management. Arch Intern Med. 2007;167(6):551–561. Fromer L. Implementing chronic care for COPD: planned visits, care coordination, and patient empowerment for improved outcomes. Int J Chron Obstruct Pulmon Dis. 2011;6:605–614. Casas A, Troosters T, Garcia-Aymerich J, et al; Members of the CHRONIC Project. Integrated care prevents hospitalisations for exacerbations in COPD patients. Eur Respir J. 2006;28(1):123–130. Roberts CM, Ryland I, Lowe D, et al; Audit Sub-committee of the Standards of Care Committee, British Thoracic Society; Clinical Effectiveness and Evaluation Unit, Royal College of Physicians. Audit of acute admissions of COPD: standards of care and management in the hospital setting. Eur Respir J. 2001;17(3):343–349. Lindenauer PK, Pekow P, Gao S, Crawford AS, Gutierrez B, Benjamin EM. Quality of care for patients hospitalized for acute exacerbations of chronic obstructive pulmonary disease. Ann Intern Med. 2006;144(12):894–903. Chang CL, Sullivan GD, Karalus NC, Hancox RJ, McLachlan JD, Mills GD. Audit of acute admissions of chronic obstructive pulmonary disease: inpatient management and outcome. Intern Med J. 2007;37(4):236–241. Liaaen ED, Henriksen AH, Stenfors N. A Scandinavian audit of hospitalizations for chronic obstructive pulmonary disease. Respir Med. 2010;104(9):1304–1309. Pozo-Rodriguez F, Lopez-Campos JL, Alvarez-Martinez CJ, et al; AUDIPOC Study Group. Clinical audit of COPD patients requiring hospital admissions in Spain: AUDIPOC study. PLoS One. 2012;7(7):e42156. Pretto JJ, McDonald VM, Wark PA, Hensley MJ. Multicentre audit of inpatient management of acute exacerbations of chronic obstructive pulmonary disease: comparison with clinical guidelines. Intern Med J. 2012;42(4):380–387. Tang CY, Taylor NF, McDonald CF, Blackstock FC. Level of adherence to the GOLD strategy document for management of patients admitted to hospital with an acute exacerbation of COPD. Respirology. 2014;19(8):1191–1197. Migone C, O’Connor M, Kelly E, McDonnell TJ. Patients hospitalised with an acute exacerbation of COPD: is there a need for a discharge bundle of care? Ir Med J. 2015;108(9):273–275. Lopez-Campos JL, Hartl S, Pozo-Rodriguez F, Roberts CM; European COPD Audit Team. European COPD audit: design, organisation of work and methodology. Eur Respir J. 2013;41(2):270–276. Benzo R, Vickers K, Novotny PJ, et al. Health coaching and chronic obstructive pulmonary disease rehospitalization. A randomized study. Am J Respir Crit Care Med. 2016;194(6):672–680. Lenferink A, Brusse-Keizer M, van der Valk PD, et al. Self-management interventions including action plans for exacerbations versus usual care in patients with chronic obstructive pulmonary disease. Cochrane Database Syst Rev. 2017;8:Cd011682. Puhan MA, Gimeno-Santos E, Scharplatz M, Troosters T, Walters EH, Steurer J. Pulmonary rehabilitation following exacerbations of chronic obstructive pulmonary disease. Cochrane Database Syst Rev. 2011;10:Cd005305. British Lung Foundation, British Thoracic Society. Ready for Home? Improving Hospital Discharge Care for People Living with COPD. A Report by the British Lung Foundation and the British Thoracic Society. 2010. Available from: https://www.brit-thoracic.org.uk/document-library/clinical-information/copd/ready-for-home-improving-hospital-discharge-care-for-people-living-with-copd/. Accessed August 22, 2017. Hopkinson NS, Englebretsen C, Cooley N, et al. Designing and implementing a COPD discharge care bundle. Thorax. 2012;67(1):90–92. Laverty AA, Elkin SL, Watt HC, et al. Impact of a COPD discharge care bundle on readmissions following admission with acute exacerbation: interrupted time series analysis. PLoS One. 2015;10(2):e0116187. Ospina MB, Mrklas K, Deuchar L, et al. A systematic review of the effectiveness of discharge care bundles for patients with COPD. Thorax. 2017;72(1):31–39.